For 2 weeks, we're showing New Yorkers what the future of farming might look like. The farm is on display from April 30th - May 13th! A new attraction arrived suddenly at the bustling intersection of Houston and Lafayette in the early morning of April 30th, bringing something futuristic and unexpected to a previously empty parking lot. 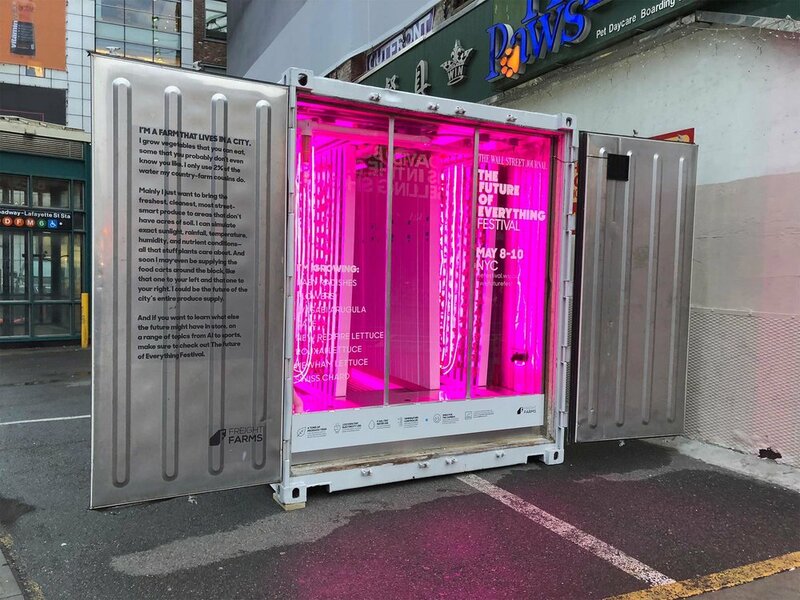 By mid-afternoon, New Yorkers were peering curiously into the open doors of one of our container farms, attracted to this new installation by bright lights that could be seen from several blocks away. 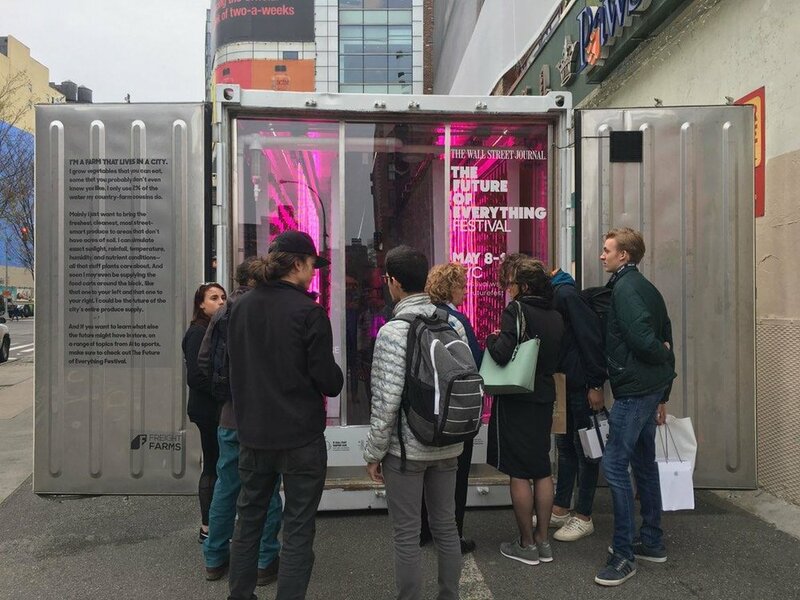 On the side of the 40-foot container is the question, “Am I the Farm of the Future?”, a nod to the Wall Street Journal’s Future of Everything Festival taking place from May 8th - May 10th. This is not the first time the Wall Street Journal has turned its gaze onto Freight Farms’ technology as decentralized, sustainable, and implementable alternative to the current agricultural methods. In fact, the WSJ actually featured Freight Farms in one of their first ever Future of Everything articles in 2016! Here's a closer look at the cargo door! "I'm a farm that lives in a city. I grow vegetables that you can eat, some that you probably don't even know you like. I only use 2% of the water my county-farm cousins do. Mainly, I just want to bring the freshest, cleanest, most street-smart produce to areas that don't have acres of soil. I can simulate exact sunlight, rainfall, temperature, humidity, and nutrient conditions–all that stuff plants care about. And soon, I may even be supplying the food carts around the block, like that one to your left and that one to your right. I could be the future of the city's entire produce supply. And if you want to learn what else the future might have in store, on a range of topics from AI to sports, make sure to check out The Future of Everything Festival." "I'm growing: baby radishes, flowers, wasabi arugula, kale, new red fire lettuce, rouxai lettuce, newham lettuce, and Swiss Chard." In partnering with the WSJ to bring this exhibit to life, we aimed to give the farm a unique voice. Passersby were not only greeted by warm purple lights, but by a friendly introduction to this foreign technology, that began with “I’m a farm that lives in a city”, and ended with “I could be the future of the city’s entire produce supply”. The whole idea was to get people to think critically about how we source fresh food today–especially in dense urban environments where there’s not enough land to farm locally. 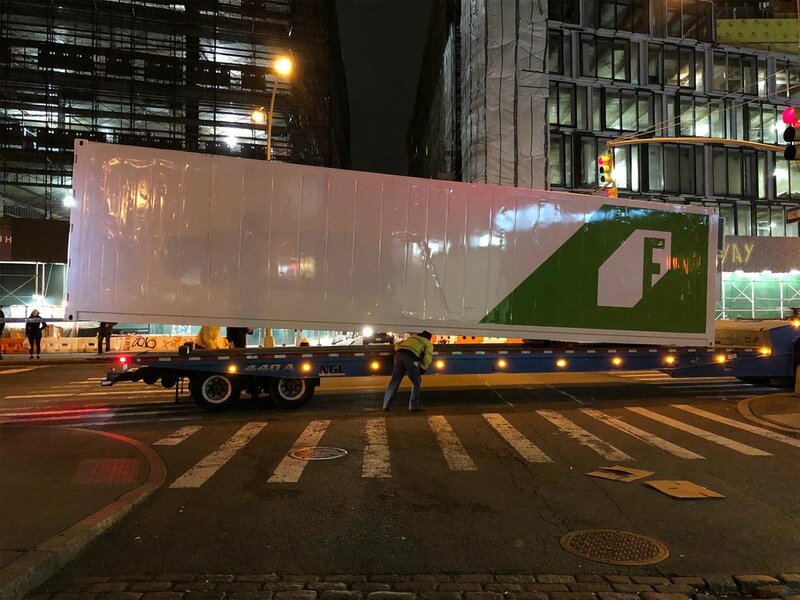 While Freight Farms is not the end-all-be-all solution to urban farming (there’s plenty of rooftop, basement, community, and warehouse farms out these making a similar change), the goal was to raise awareness about the very real solutions that are out there, and get people excited about a “future” that was very quickly becoming a reality. While this container farm is only temporarily residing in Manhattan, urban Freight Farmers are already making a difference. Most notably, there’s Square Roots just across the river in Brooklyn. They’re using 10 Freight Farms containers to create an urban agriculture accelerator, where young farmers get the chance to run a farm as their own business, working with restaurants, selling at farmers markets, and managing CSA subscriptions. There’s also Acre in a Box with two container farms in Houston, Corner Stalk Farm with four container farms in Boston, Madar Farms with three farms in Abu Dhabi, and so many more. Here are just a few fun moments from the farm! It was a little tricky getting the farm in place, but we managed to do it, no problem! Once the sun sets, we get so many curious passersby, who are attracted to the bright purple lights! Freight Farms team members were there rain or shine to answer all of your questions. It grew SO big! We were able to hand out a lot of kale during the farm stand. We did a fun fresh food giveaway! Everyone was floored by the fresh, crisp, and intense tastes. Everyone’s so excited to try their veggies! Our plants are happy and healthy in spite of their unusual location. We also caught this super cool timelapse from the farm's display window! Nope! We’re actually a startup out of Boston that’s been working on this technology since 2010! We built our first prototype in 2012, and have now gone through 8 iterations! Today, we have about 200 of these units in 35 states and 12 countries (not counting the US) that are fully operational. We’re not, although you’re not far off! While Square Roots is an independent company, they are using 2016 Leafy Green Machines! No we’re not, although we will be donating a lot of what’s growing to a local food bank. Freight Farms actually specializes in designing, building, and distributing the entire unit! We sell to a variety of customers, including small business farmers, universities and schools, corporations, non-profits, and municipalities. Yep! It’s a fully hydroponic farm that uses nutrient-rich water to re-create the nourishment that plants normally get from soil. Not having soil is what allows us to grow vertically, which makes the container farm an incredibly dense growing environment: the 320 sq. ft. unit can grow 2-4 tons of produce every year… that’s the same as the average African elephant! While they do look super cool, the lights are critical for the whole thing to work! We use high-efficiency LED strips to replicate sunlight. The reason they glow purple is because we’ve isolated out the red and blue light from the full light spectrum. The plants are able to absorb red and blue light much better than other types, making the LEDs extra effective. We’re really good at recycling the water. The farm is slightly tilted, so that any water that drips into the gutters and runs back into the tank to be re-filtered and re-circulated. Additionally, our dehumidifier and A/C are very efficient at capturing any water in the air. All these things combine allow us to use 0-5 gallons of water everyday, which is less than most dishwashers use per cycle. That’s what we’re working on! But, in all seriousness, our container farm is a sophisticated piece of machinery that requires some hard work and dedication. While it can be easier to purchase and operate a farm than find and buy farmland and learn the intricacies of soil farming, there is still a lot of learning and trial-and-error involved. The good this is that, as the network grows, so does the support! We see our farmers relying on each other heavily for advice and support, which warms our hearts. We obviously hope to see this network grow in the future as people become more and more dedicated to growing fresh and local. Interested in seeing the farm for yourself? We’ll be at Houston and Lafayette until May 10th! Otherwise, contact us to book a tour of our Boston farm, or to learn more about the Freight Farmer in your area.